Low bikes may still be the most popular, but the days when “recumbent” had to mean “small, odd-sized wheels” are long gone. While there are plenty of reasons to go for a small wheeled bike, almost everyone now makes a recumbent running “full size” 700c hoops. These bikes are increasingly making an favourable impression, especially on the long distance circuit. Where once you had a stark choice between small wheels or the extreme height of a US-style stick bike, there are now options to suit a much wider range of riders. David Gardiner at Laid-Back-Bikes specialises in all of these models (each one is a Laid Back demo which I have reviewed in depth), and I recommend interested parties get in touch with him to discuss your individual circumstances. Combining big wheels with a low seat height and trademark versatility, including the ability to take discs and big tyres, pannier racks, or carbon aero wheels and a highly reclined seat, there’s something for everyone here. Front wheel drive on 700c! Built to the same robust standard as other Nazca bikes, and with the same comfort factor thanks to the rear shock, the Gaucho 28 gets you up high (but not too high!) and rolling easily over rough roads. Thin slicks and caliper brakes only. MetaBikes caused a flurry of excitement with their short-wheelbase, braced aluminium frame (there’s now also a carbon option). The classic Baron lowracer got a 700c front wheel in this update, merging the best features of stretched low bikes with the advantages of full-size wheels. The archetypal stick bike – light, stiff, very high and relatively hard to handle. Not easy on the eye, but may be friendly to a tight budget. When it comes to options, two of these bikes stand head and shoulders above the rest: the RaptoBike Midracer and the MetaBike. The MetaBike can be equipped with disc wheels and 26″ or 29er MTB tyres (there’s clearance for my 2.1″ knobblies in the carbon disc fork), or with caliper brakes for 26″, 650-, and 700C road wheels. The RaptoBike Midracer can only accommodate a 700x25mm tyre to the rear, but can go much larger at the front (and if you drop down to 26″ or 650- size, both ends can be very chunky). As well as caliper and disc brakes, both ends will accommodate cantilever / v-brakes. Both the MetaBike and RaptoBike Midracer will take a standard pannier rack in addition to seat-based bag solutions. In contrast, the Corsa, High Baron and Gaucho only support caliper brakes and take relatively narrow 700c wheels only (although if you *never* want full size wheels, you can buy a 650C Corsa or a Gaucho for 26″ or 24″). The High Baron and Gaucho won’t take a pannier rack easily (update: you can order a Gaucho with rack mount braze-ons as an option). You can at least fit the Corsa with specialist pannier racks that hang between the wheels. The Gaucho’s rear suspension makes it an outlier in terms of overall efficiency. I don’t want to pretend that I have any meaningful measurement of this, but it is noticeable to me when I ride a suspended bike over a rigid one. (I still completed Paris-Brest-Paris comfortably on the Gaucho, overtaking countless riders up and down hill). Simple factors can be more complex than you might think – for instance, even the supended Gaucho’s drivechain is straighter than the Bacchetta Corsa. Despite received wisdom it seems that Euro frames may (at least sometimes) have a straighter drivetrain after all. The Corsa is noticeably at home on the open road, rolling easily – partly redeeming a bike that I found so bad in traffic that it’s the only one I wouldn’t consider commuting on (and I commuted for years on a lowracer). Subjectively, I can’t help but feel the giant-size open cockpit is compromising performance a little. Both the High Baron and MetaBike deliver in spades on the efficiency front. The Baron is lower and more stretched out, has triangulated rear stays and a huge internal gusset welded into the bend of the frame. The MetaBike has fat tubes and the distinctive triangulation at the head tube gives it legendary stiffness, while the drivetrain has one fewer idler on the return side of the chain (three VS four on the Baron, including the idlers in the rear mech). I’m not sure how significant return idlers can possibly be, but at gunpoint I’d probably give the edge to the MetaBike overall, although I think the aero difference between two riders could easily swamp the difference between the two bikes. 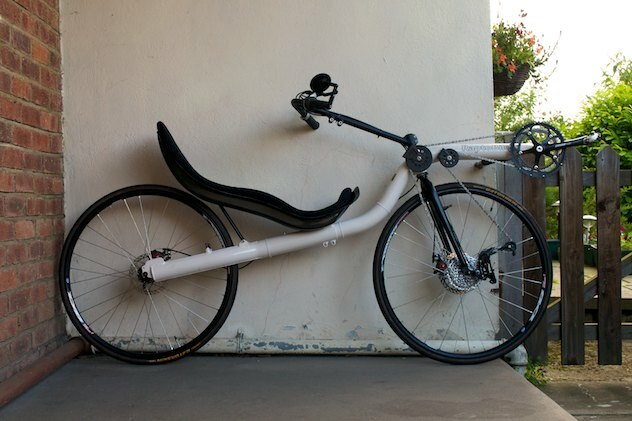 Every recumbent handles differently, and not always in a good way. Even between these five superficially similar 700C bikes there are major contrasts, and while I believe you can learn to master any bike, that doesn’t make things equal. Plenty of people have shoes that don’t properly fit them too. That said, I’d be the first to admit that some aspects of bike handling are subjective, so I want to be clear that I’m obviously drawing on my personal preferences here. The weakest bike by a country mile is the Bacchetta Corsa. The open cockpit interferes with tight manouvering – the excitement of stabbing your thigh into your handlebars while carving round a bollard is… considerable. The huge height of the bike really made it awkward in stop-go traffic and had me scrabbling at the ground with the tip of my shoe on multiple occasions: I’ve written specifically about stick bike seat height issues as a result. The Raptobike does present the danger of mangling your clothes and/or inner thigh on the power idler, and that might be significant for some (I found it contributed to knee issues over great distances). It’s a very direct-feeling bike, otherwise. 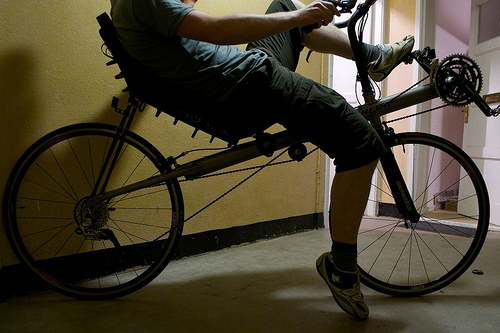 The MetaBike is possibly the biggest disappointment I’ve had in recumbent handling. Having read so much about these bikes taking the BentRider forum by storm, I had pretty much convinced myself I was going to buy the Laid-Back demo the moment it arrived (I’d spent the best part of a year doing trials and hadn’t found anything to replace my RaptoBike lowracer). Unfortunately I found the MetaBike sharp to a fault – even sharper than my upright DF racer. It just wasn’t a reassuring bike to ride, for me, and this killed the enjoyment that riding such a stiff frame should bring (and believe me, I really wanted to like it!). For me, the Baron has almost flawless handling. It corners so assuredly at high speed that it frankly embarrasses most other bikes, while the rock solid cockpit gives you the confidence to pour on the power. Despite being low and stretched out, it still manoeuvres well around tight obstacles, and of course it’s effortless to dab. Unfortunately there’s a real issue with the Baron’s brakes, especially at the rear. It’s very difficult to get them set up to work satisfactorily, and indeed I still put up with poor braking in exchange for the bike’ great performance otherwise. Say I was to climb solidly with my long-lost twin for an hour – the version of me on the CA2.0 would nose ahead by around 0.13 miles, or 208 meters. To combat this, the version of me riding the High Baron would need to average 254W instead of 250W (unfortunately this is not much above the 1% quoted accuracy of most power meters, so let’s not take the test to extremes). Of course, there are reasons besides performance to enjoy a light bike… just don’t overplay it to the point that you buy a bike which is compromised for your needs under the impression that a pound or two will make any real difference to your performance on it. I made my choice and am now the proud owner of a red Baron… however, that’s not to say that I would recommend the Baron to absolutely everyone. The best thing you can do is get in touch with an experienced dealer who can talk you through your options, and potentially arrange demos. In this case all five bikes came through Edinburgh’s Laid-Back-Bikes. Get in touch with David Gardiner and he’ll be pleased to help with any enquiries. I own suspended Challenge Chamsin and looking for bike that can have fat tires. So MetaBike is not a option? Can you please explain what you mean by “Unfortunately I found the MetaBike sharp to a fault”? Maybe just use different wording? Sorry for my English. Thank you! MetaBike definitely a good option for wider tyres. In fact, probably your best option overall. Regarding the handling: I found that the MetaBike was quite twitchy – it wasn’t as calm as I would have liked (trying to find alternative words). Lots of people like it, and I could ride it just fine, but I wasn’t as comfortable especially when going faster. I felt like I was spending more energy staying on top of the bike and thinking about what was coming up, whereas the High Baron just corners like it’s on rails, very reassuring. I must admit I shared your disappointment of the MetaBike but ,as always, a personal experience. Coming from a limited recumbent bike experience and buying a Raptobike Lowracer based on reviews I was excited and nervous finally visiting Laid Back’ and trying a couple more, finally taking the Meta’ out for the day. Being the only seasoned recumbent rider I was sure to be the first off the line and most confident, but no! I personally found it so sharp and hard the first couple of hours were hair raising! Thats being used to tiller steering as well. Got used to it eventually and liked the high views but left happy to go back to my Rapto (which was kind of reassuring!). Never felt I could get the power down as strongly either. Again this is all personal opinions and I have to say it seemed well made, strong, rigid and lovely to be seen on as well as quite maneuverable (after a front wheel drive) so I can see how people take to them strongly. Oh to have a LBS stocking bents down here in Wiltshire for some test rides! An excellent round up. i’ve enjoyed the subsequent discussion on some of the boards. As far as I am aware this is the only collected group of reviews. To me they are a valuable resource. I love my Fuego but have recently been riding a Furai 26. On the coarse road surfaces I ride round here the bigger wheels immediately felt less draggy. As one of the older (and therefore slower) riders the 700c format may well have something to offer. Please add to these reviews as and when other machines become available. @Martin – thanks for the comment. Interesting that you felt the same way – that makes a few now. Glad to know I’m not completely out on a limb here! I do feel the Meta has a lot going for it, perhaps it just requires more getting used to than usual, or maybe there’s something about the Raptobike that makes it seem wrong afterwards? @john, thanks for the feedback. Personally I really noticed the different going to a large front wheel – I’ve got Ultremo 28mm on the Baron and it’s just so smooth over your typical broken up borders tarmac. I used to think it was all about the aerodynamics but for everyday riders at normal speeds, I think RR has been underplayed. Unfortunate we didn’t have the Edge Haiku in your hands. It’s probably the only American made dual 700 that would compete with these since it is also the only US made cutaway frame hi-racer. We’ve received some very good compliments on the bike at RCC with easy stepover height, excellent low and high speed stability. @Bill I am by no means USA dual 700 expert, but what about Cruzbike Vendatta? It would be very nice if you can test and review Cruzbike Vendetta and/or Silvio. 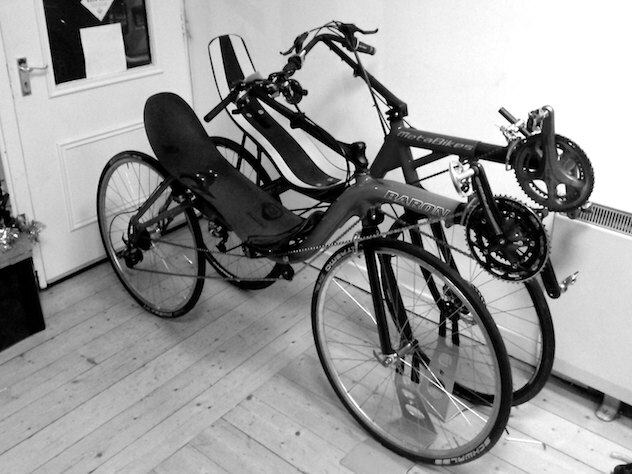 From my point of view MBB recumbents is only way for people with short legs who wants 700c wheels (and SWB). 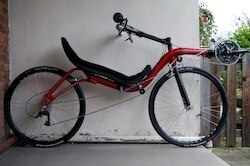 With my 98 cm x-seam I will have colision of cranks and front wheel and/or I will not achieve ground by my feets on 700c wheeled SWB recumbent. I’m definitely interested to try the Vendetta, but it’s pretty much non-existent here. I’ve discussed it with John before, and he thinks it would take much more than a few weeks of casual riding to do the MBB justice. In due course the opportunity will arise I’m sure! And what about some M5 bikes? Like Carbon Highracer or M-racer? I’ve ridden with a few CHRs but never on one, much less had it to myself for a few weeks… another one I hope for in the long term. Another well-considered and informative review Dave. Thanks. As a Metaphysic owner I wouldn’t disagree with your comments on the “sharp” handling of the dual-700 version. However, on the whole it is not a problem for me. Personally, I find the bike is quite stable at speed, and at higher speeds – e.g. 40-75km/h while descending – I can happily cruise (but not pedal) hands off, and even steer hands off through shallow bends using only body weightshift. Where I find the “sharp” handling issue to be a little disconcerting is what I would call its “twitchiness”. Difficult to explain, but perhaps best described by saying that, despite the feeling of stability, any sudden handlebar movement or forced deviation by a road feature gives a sudden and sharp reaction between the front and rear wheels. This results in an abrupt “twitch” which, if not rectified, feels as if it could throw me off course, or even cause a fall. However, I’ve never actually had any nasty near misses as a result of this, and it’s probably more a subjective sensation than an objective danger. Nevertheless, I wouldn’t say that the bike feels “as if it’s on rails”. I’d love to try a Baron HiRacer to compare the rides. 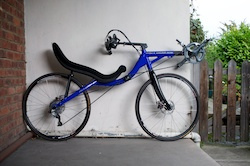 I’ve home built quite a number of recumbents – LowRacers and Mid/Hi Racers, FWD and RWD – and found that handling can vary noticeably with just small changes to the design. In my view, centre of gravity placement and wheelbase play a large part in determining stability and handling feel, and I wonder if the Baron’s lower CofG and slightly longer wheelbase might give it the edge over the Metabike. The same probably applies to the Raptobike dual 700 model. I don’t have anything against the Meta – I would almost certainly have bought one had I not had the opportunity to try the Baron – but I just felt that I couldn’t really tell the two bikes apart in terms of performance and so the Baron’s great handling clinched the deal. Dave, if I’d had the chance to compare the two as you did, I may well have made the same choice (although I still love my Meta). TBH not really sure what the carbon frame version adds to the Meta range. If I was going to splash out that much, I’d probably go for a Zockra. Hand-made beauty, built in France (Vannes) by a thoroughly nice french chap who’s very experienced in working with carbon fibre. Similar shape to the Baron, but maybe (?) a tad lower. Very light, very fast, totally gorgeous! Yes. So many bikes….. so little time…. (sigh). At least you have a friendly local bent bike shop to feed you test rides. Makes us envious! Keep up the good write ups; it’s a close as many of us may get. Interesting comparison. I have always had the belief that handling is the most important factor but as unexperienced riders will find they become accustomed to riding what they have. In some cases I believe builders are copying road bike geometries with their design without proper testing. More professional builders have different frame sizes to accommodate not just size, but handling which changes from weight bias. Optima obviously has this as their Low Baron is legendary in handling. 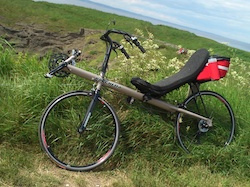 The German builders, Troytec and Toxy, have what appears to be very steep steering angles and yet handle very solidly. Different wheel sizing aside it seems they don’t copy the norm to give an excellence of ride quality. Aside from all of that our needs change with individual requirements too. As ones back cannot tolerate hard shell seats with lower angles, a suspended bike can provide all day comfort. What would be good is if one, like yourself, has the ability and patience, to test all that is available. Reminds me of Goldilocks. It’s a good point – people get used to what they know. I fitted a 700c front wheel to my Raptobike lowracer and rode my Paris-Brest-Paris qualifiers on it… handling was terrible with tremendous fork trail but I got used to it after a hundred km or so, nobody else could ride it though! Very interesting review indeed. 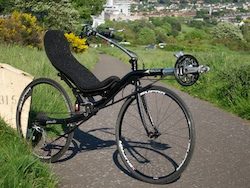 My first recumbent was a Raptobike Low Racer which I found twitchy at high speed! Lifting one hand at 50 kph was mission impossible. I now own a Metabike and that problem is gone: I am now able to drink from the bottle while riding and it is much easier to balance the bike at low speed, especially uphill. 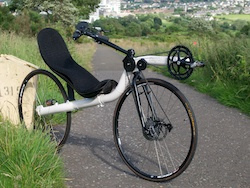 I can imagine that modifying the seat angle and the seat position on the frame of the Metabike will affect its handling by changing the front-rear weight distribution. That might explain the different riding experiences. Someone who’s owned or ridden an M5 CHR–can you please comment. I have ridden a metabike (london Edinburgh ratrace), owned a High Baron and now have a Gaucho 28. I really wanted the high Baron to suit me but It didn’t fit my long back, short legs. The height difference/angle between the seat and crankset made an old rugby back/hip flexor injury flare up. It was however a lovely handling, super smooth bike – as Dave describes. The metabike I also found very twitchy and slightly unnerving at times – however I did get used to it during London-edinburgh. So for the 6 weeks I have had a new Gaucho 28 (with the lower seat angle and short air suspension). I am blown away by it – very comfortable, great handling and not any slower than my High Baron. I thought this would be a penalty for the increased comfort – perhaps though it is this increased comfort that makes it as fast. The Baron could be slightly harsh on poorer tarmac (what isn’t though!) and there were times I would probly have free wheeled – i continue pedaling on the Gaucho. Uphill speed is good, like the Baron extra pedal effort is rewarded by a fairly instant increase in speed. Like the Baron I have also changed the standard fork with a carbon disc fork and hydraulic front brake. I like the security of the stopping power! The other difference is going back to a triple chainset with 165 cranks. This I think also has improved efficiency with less difference between ratios when going 50 to 39 compared to a compact’s 34. I suspect this has helped keep my average speed similar. The Gaucho is heavier, I am less fit now than I was a year ago when I was regularly riding the Baron, average speed is pretty much the same. Both the Baron and Gaucho are hugely entertaining rides. Thanks for that update Peter – great to hear a second opinion on these bikes. I’m pleased you’re getting on well with the new Gaucho… Tour o’ the Borders next year maybe? Yes hopefully next year. Couldn’t do it this year due to family commitments. Delighted to see that you and David posted great ‘bent times!